Each of ZenQuest’s children’s programs provide a balance of learning and activities to keep training interesting and FUN! Since every student has their own interest and goals, they may choose to focus on only one art...or be more diverse to build a rounded package of skills. Our classes feature “age-appropriate” instruction, in an environment of mutual support and respect. Younger kids are provided with more activities and games, while older students focus more on martial skills. 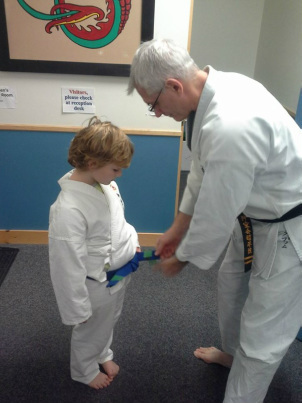 Our experienced instructors use proven methods to help young students learn important life skills like focus, discipline, respect, responsibility, confidence, perseverance, honor, leadership, and having a positive attitude. Each art provides effective self-defense skills AND an exciting fitness program. Students typically improve flexibility, strength, coordination, and cardio capacity. An early appreciation for fitness can lay the groundwork for a long and healthy life! Our children's Karate classes are based on a dynamic “striking” art from Okinawa, Japan best known as Uechi-Ryu. They cover a range of material including warm-ups, stretching, Karate FUN-damentals, combinations, target drills, and partner training. Self-defense strategies include evasive movement, blocking, grasping, punching, kicking, sweeping, and throwing. Although Uechi-Ryu (a.k.a. Shohei-Ryu) provides valuable self-defense skills, the personal development aspects are far more rewarding over time. Student are placed in age divisions based on age, size, maturity, and sibling participation. ZenQuest is an affiliate of the Okinawa Karate Association, and all rankings and instructors are certified through that internationally respected institution.